Blue is mains voltage, red is current and green is power. The non linear nature of the load has distorted the sinusoidal supply voltage. AC power to homes, factories and offices is normally delivered at a frequency of 50 or 60 Hz, depending on the region of the world where you live. Power generation companies are obliged to deliver “clean” sinusoidal supply voltages within certain limits set by national regulatory bodies. If the load presented by the consumer is linear, the current waveform is also sinusoidal. Many modern devices do not present linear loads to the AC supply. Instead they take “bites” out of the supply waveform, so the current drawn includes harmonics of the 50 or 60 Hz fundamental supply frequency. Harmonics are a distortion of the normal electrical current waveform. Switch mode power supplies (SMPS), variable speed motors and drives, lighting controls, personal computers, TVs and battery chargers are examples of nonlinear loads. SMPS contribute a large part of the non-linear electrical load on most electrical distribution systems. For example, all computer systems use SMPS that convert utility AC voltage to regulated low-voltage DC for internal electronics. These non-linear power supplies draw current in short, high-amplitude pulses that create significant distortion in the electrical current and voltage wave shape – harmonic distortion, measured as total harmonic distortion (THD). The distortion travels back into the power source and can affect other equipment connected to the same source. Overheating of electrical distribution equipment, cables, transformers, etc. Harmonics are currents or voltages with frequencies that are integer multiples of the fundamental power frequency. If the fundamental power frequency is 50 Hz, then the second harmonic is 100 Hz, the third is 150 Hz and so on. 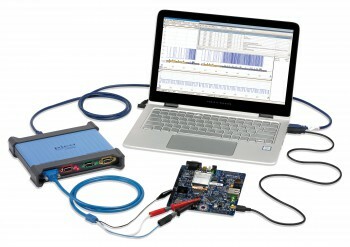 The PicoScope 4444 is ideal for measuring current and voltage harmonics from single and three-phase systems. The oscilloscope allows the waveforms to be viewed in the time domain and the spectrum allows the harmonics to be displayed and THD to be automatically measured.